If you’ve recently upgraded to Windows 7 or Windows 10 and are wondering what happened to HyperTerminal, you’re not alone! HyperTerminal was a sweet little program that let you connect to other computers, Telnet sites, host computers, BBSs, etc. using your modem or Ethernet connection. In Windows 7, Vista, and 10, you will no longer find the HyperTerminal program. If you need HyperTerminal to control serial devices, there is a way to get it back! Also, there are several new alternatives to HyperTerminal that are probably better for secure shell access and troubleshooting modems. Firstly, if you only need remote shell access, you can use the new Windows Remote Shell command line option in Windows 7/8/10. 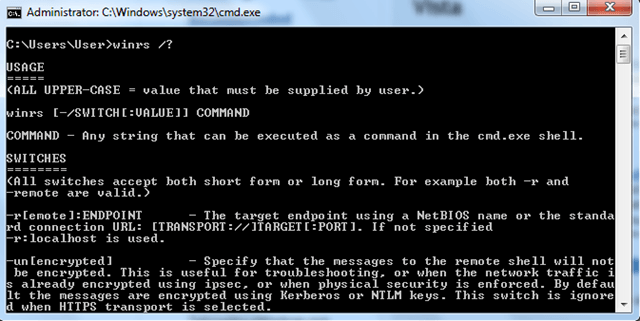 To learn more about using WRS, simply open a command prompt and type in winrs /?. It’s basically a SSH replacement that allows remote command line access over an encrypted connection. It also uses the SOAP protocol. You can also check out the Microsoft doc on winrs that gives you some examples. If you were using HyperTerminal to troubleshoot modems, you can now use Phone and Modem Options to do this. Go to Control Panel, click on Hardware and Sounds and then click on Phone and Modem Options. If you don’t see it there, click on the drop down by View items and choose Small icons or Large icons. 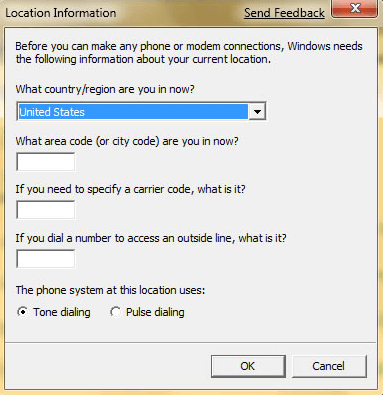 All you have to do is provide information about the Country/Region, Area Code, Carrier Code, and Outside Dial Number to access the dialog box. Once you do that, you can troubleshoot your modem in Windows 7 or Vista. If you don’t want to use all these alternative methods, you can still use alternative programs for HyperTerminal. Here are some of my favorites. 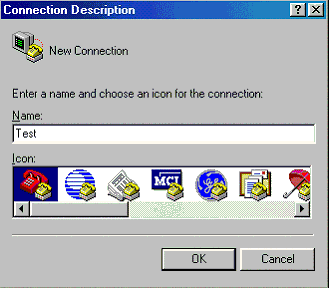 HyperTerminal Private Edition – This is a commercial terminal emulation program that you can use to communicate with serial COM ports, dial-up modems, and TCP/IP networks. If you need a good HyperTerminal program for Windows 10, then this is your best option. If you just can’t live without the original HyperTerminal in Windows XP, you can actually extract two files from your XP installation and copy them over to Windows 7/8/10. If you have the Windows XP CD, you should be able to find both of these files in the i386 directory on the CD. So that’s about it! Even though HyperTerminal is no longer in Windows 7/8/10, it’s really not needed since you have a lot of great alternatives like Putty, etc. If you want it simply because you’ve been using it for a long time, either download the Private Edition or copy the files from XP. Enjoy! What is Msmpeng.exe and Should You Remove It?